With the Lakeville Art Festival soon here, learn more about the trails and bike friendly street routes around town on the Tour of Lakeville. This year the Pedal in the Parks ride series starts and ends at Pioneer Plaza Park on Saturday, September 15th. The park plaza is located in downtown Lakeville where the Art Festival takes place, Saturday and Sunday on the same weekend. 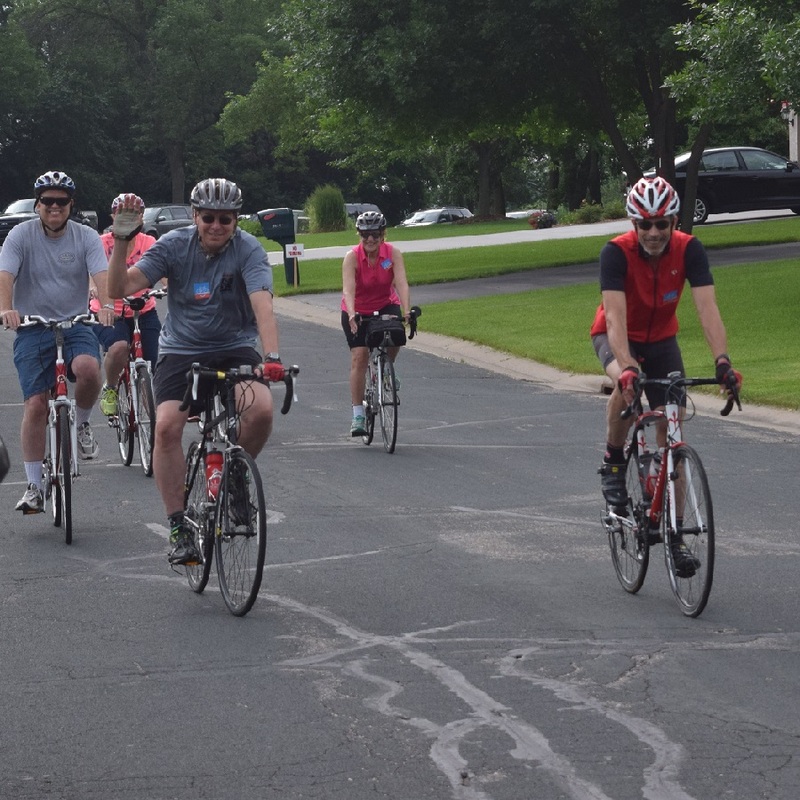 The scenic route of this years bike tour will help those who participate learn how to safely get around Lakeville. Then, after the ride check out the art festival. Or, try Lakeville’s new mountain bike park for some adrenaline biking fun. In celebration of its annual art festival the third Tour of Lakevills ride will happen Saturday, September 15th. Great view of Lake Marion as the tour passes the West Lake Marion Mountain Bike Trailhead that opened last year. The newly paved Juno Trail that hugs the lake shoreline. The popular Antler’s Park with swimming beach, picnic areas, volleyball, and horseshoes. On Ipava Trail, just north of Ira Lane, reach the highest point of the ride, 1,108 feet, for a fist bump. Listen for birds and look for butterflies on the paved trail through Michaud Park Conservation Area. Don’t worry no one will be dropped on this family friendly ride. However, all ride participants are expected to ride at a moderate pace so everyone can share their favorite ride stories after returning. Coinciding with the Lakeville Art Festival, the tour begins at Pioneer Park Plaza, in the downtown area, at 20801 Holyoke Ave. Lakeville, MN, 55044 . Bike tour participants will return back to the downtown area so they can take in the art festival. You can register online for this bike ride with the city parks department by clicking here or call 952-985-4600 for more information. The ride is scheduled to last approximately two and a half hours. This is time frame is dependent on the number of registered bikers and the route. Please bring a helmet and water bottle. Considered by many to be one of the finest art festivals, the Lakeville Art Festival is held the third weekend in September. This year the event will feature over 90 artists in an intimate and accessible setting. The artist booths are staged in a park-like atmosphere. This allows for a unique circular type arrangement to help showcase their work. Plus many of the artists have scheduled demonstrations over the two days of the festival. Another family friendly highlight at the art festiva,l stop into their “Young at Art” tent. This workshop area is stocked with plenty of art supplies, ideas and experts to get the creative juices flowing. Working closely with the city, the Lakeville Cycling Association has constructed a mountain bike trail system on the west side of Lake Marion. Another family friendly attraction, the new course is approximately five miles in length. The trail segments in the park allow plenty of fun features for beginning, intermediate and advanced mountain bikers. This is a single track, one way, trail system that includes multiple switchbacks, berms and rollers. Final work for this trail was recently completed for all to enjoy. 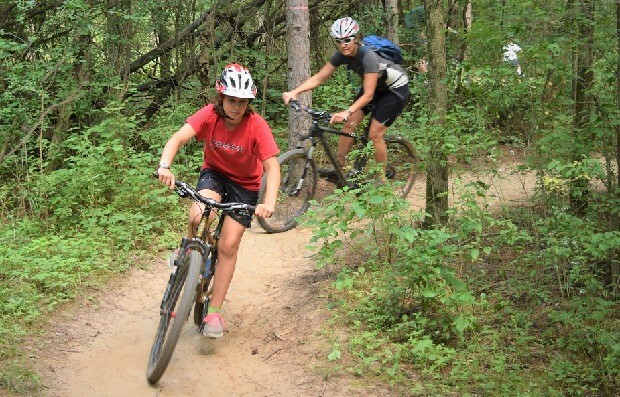 The new Lakeville mountain bike course is fun for the whole family. To check out his new, year round, mountain bike trial system see map. You can access the trail head in Casperson Park, by parking in the gravel lot north of the soccer fields, at 19720 Juno Trail. Watch for trail updates and trail conditions on the clubs Facebook page. For those visiting the area who want to learn more about connecting from the area hotels to the trails and fun things to do when not riding, see the At-A-Glance Lakevile and their map. 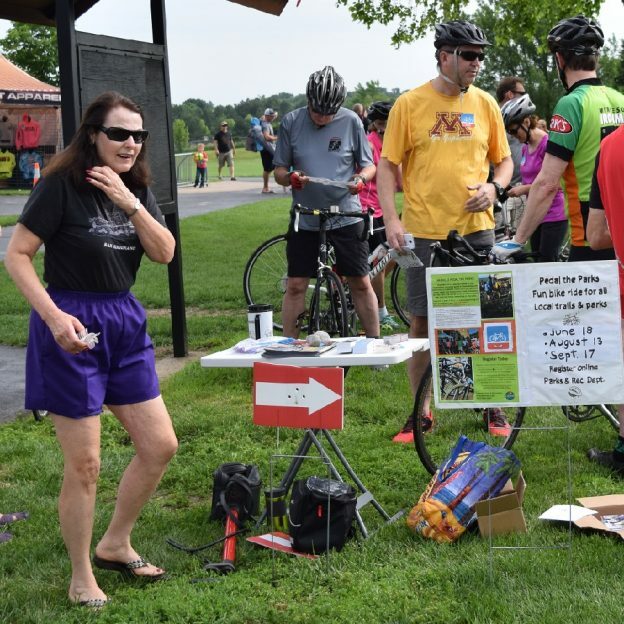 This entry was posted in News and tagged bike, Biking Lakeville MN, city parks, Friends of the Environment, fun, Lakeville Art Festival, Lakeville Cycling Association, Mayor Douglas Anderson, music, ride with the mayor on August 11, 2018 by Russ Lowthian.